Photo: Taken at The Daily Catch, St. Lunaire-Griquet. The Quidi Vidi Brewing Company located in St. Johns, NL is home to award-winning beers, notably Eric’s Red. I am a fan of the Traditional 1892 Ale. 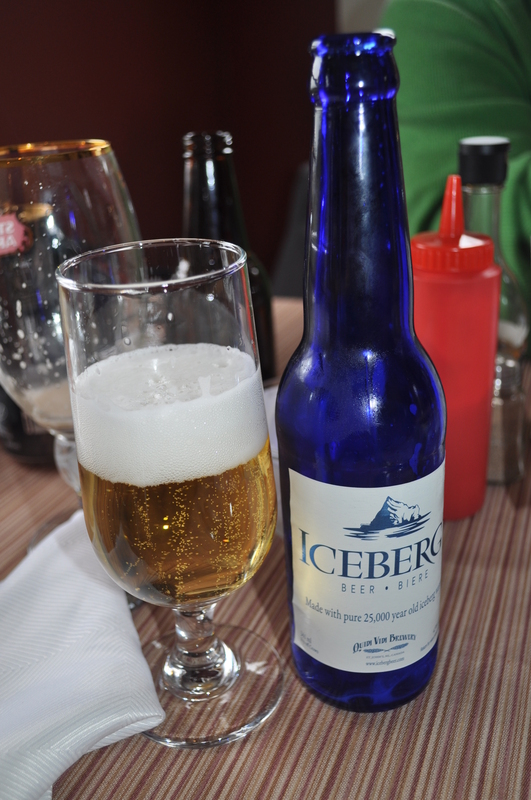 However, since introduced to the Iceberg Beer®produced by this local company, I have a new favourite. My first taste of the sweet bubbly was at The Daily Catch Restaurant, when owner Terry Hedderson provided me with a sample. I was sold from the very first taste! Quidi Vidi has done a fabulous job setting this beer out from the rest, with a simple white label, long neck and beautiful blue-bottle. The bottle is elegance – as different rays of light hit it, parts change to darker and lighter tones of blue, yet the clarify remains. Once poured in a glass, it is absolutely pure. The senses are peaked with the taste, as it is truly a clean and refreshing beer worthy of its premium price point of $17.98 for 1/2 dozen at a Newfoundland & Labrador Liquor Store/Express. Beware, not all outlets carry it. I have only found this product at Hedderson’s Store, St. Lunaire-Griquet en route to L’Anse aux Meadows. This business carries a large selection of beer and variety of wines, including local products. If you would like to drink a beer that is Made with pure 25,000 year old iceberg water, then it can be experienced right here on the Great Northern Peninsula. Posted on July 16, 2011, in Business, Cuisine and tagged Beer, Great Northern Peninsula, L'Anse aux Meadows, Newfoundland & Labrador, Quidi Vidi, Quidi Vidi Brewing Company, St. Lunaire – Griquet. Bookmark the permalink. 7 Comments. It’s nice to see that you have researched this topic, pvdiroed good quality information and presented interesting points that compel your readers to think. I appreciate the effort you put into your content. Thank you.